The Wat Pa Luangta Bua Yannasampanno, or Tiger Temple, in Kanchanaburi is attracting a torrent of visitors interested in being up close and personal with one of the world's most magnificent, and dangerous, beasts. The temple currently houses has 18 big cats, with names such as Storm, Lightning and Rainbow. 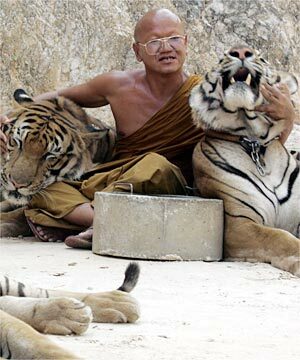 Resident monks say visitors typically approach the tigers with some trepidation, but in the end, the cats prove irresistible for most. One monk at the temple said he had not seen any serious accidents since visitors started coming some five years ago. "A few tourists were slightly injured, scratches from the naughty little tigers, but no serious accidents have been reported," he said.